How to Complete Virtual Classroom Session? Online learning and training classes have become very important in a student's day to day life. Most of the students don't get enough time from their part-time jobs and extracurricular activities to attend their classes regularly. Because of that, they miss their lectures, and that's why they prefer to have virtual classrooms. It's quite similar to e-learning and has proven very convenient for them. But things are not so easy as it seems for availing online classroom sessions. Students face a lot of challenges in accomplishing it effectively too. 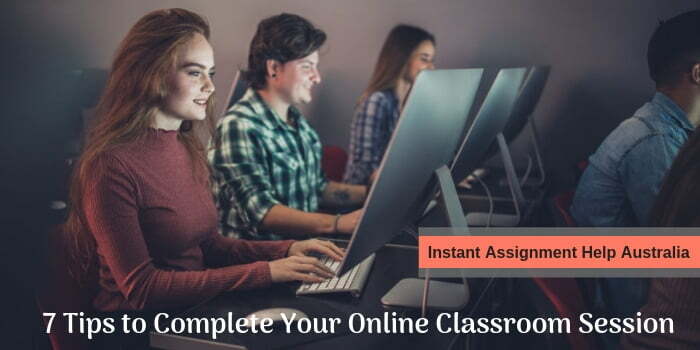 Keeping their problems in mind, our Australian assignment help experts have enlisted a few tips that can help them in completing their online tutorials easily. If you too have enrolled yourself for online courses, then this blog will certainly be beneficial for you. Just have a look at these important tips. The very first important thing to do before enrolling for online classes is to determine your objectives and what you are seeking out of that particular course. When you set goals for yourselves, then you're more likely to manage time for yourselves. It will also help you develop different strategies to accomplish your classes on time. Moreover, you will become capable of choosing various learning materials, tools, and ways in order to achieve your aim. At the beginning of each course, you should make a study plan as it will keep you on track. Organize yourself and set a fix amount of time per day for studying. You can also plan a weekly schedule with date and time. Make sure that you have enough time for other activities too. Pick a place where no one can disturb you and where you can study with better concentration. You need to find a distraction-free place to study because your every minute is crucial for your academic success. Studying in a peaceful area works because if you will not get disturbed, then you're likely not to lose your focus. If you're going to avail an online facilitator or instructor for you, then you need to have a guide for yourself who can help you gain the maximum output from those classes. If you can manage to have such a guide, then you can attend all the online classes without the assistance of e-learning professionals. Write down all the essential points as like you do in traditional classrooms. Preparing notes will help you collect all the important information. It's not so easy to watch videos for 2-3 hours straight and then remember everything. It's better to make bullet points of the important data that you hear. It will help you retain all the information. Active participation is the most important factor in the accomplishment of online courses. The most useful way to do this is by developing learning sessions that can enhance your thinking ability. For example, games, online presentations, and more. It can be done virtually too by using Google services, like Google Hangouts or Skype. You should take frequent breaks while taking online tutorials. There can be a chance that your mind may become numb after staring at the computer screen for several hours. Taking regular breaks can avoid such situations as well as can boost up your studies. So, you should take a pause of 5 minutes after every hour of studying. Hope these tips can give you the opportunities to develop the best possible virtual training experience so that you can sharpen your skills, increase your academic knowledge, and upgrade your academic records.